Hailed in BBC Music Magazine as “Kings from the East,” Bach Collegium Japan is widely recognized as one of the world’s leading interpreters of J.S. Bach and his contemporaries. Its inspirational Music Director Masaaki Suzuki founded Bach Collegium Japan in 1990 to introduce the Japanese audience to period instrument performances of great works from the baroque period. For this concert the ensemble has invited acclaimed British soprano Joanne Lunn for a programme including J.S Bach’s Orchestral Suite no 2, Vivaldi’s Concerto for two violins in D Minor and Handel’s virtuosic cantata for soprano Silete Venti. Through their acclaimed BIS recordings, Bach Collegium Japan has shared their intriguing performances of the baroque repertoire. 2014 saw the triumphant conclusion of their recorded cycle of Bach’s complete Church Cantatas, a huge undertaking comprising over fifty CDs initiated in 1995. This major achievement was recognized with a 2014 ECHO Klassick ‘Editorial Achievement of the Year’ award. To download this programme, including the texts and translations, click here. With one exception, the diverse selection of music on today’s programme belonged to the library of Johann Sebastian Bach. Because after his death Bach’s library was divided among family members outside of official inheritance regulations, no catalogue of his personal collection survives. What we know today about the literature and music that interested, influenced, and inspired him is the result of 150 years of scholarship recovering autograph manuscripts; music copied by his wife his sons, and his nephews while they were a part of his household; work of composers whose music Carl Philipp Emanuel claims his father studied; and more. The reconstructed catalogue shows that, though Bach himself traveled very little, he collected, studied, and performed music from all over Europe, and kept himself well-abreast of musical trends. The overture or orchestral suite was tremendously popular in early eighteenth-century Germany. Bach’s colleagues Telemann, Fasch, and Graupner each wrote about 100 of these pieces. By comparison, Bach showed less interest in the genre, but his four suites that we do have are masterful. His Orchestral Suite in B Minor, BWV 1067 marries French dances with the concerto-like brilliance of Italian composers like Vivaldi. Likely, Bach wrote this piece during his time as kapellmeister to the Prince of Anhalt-Köthen as a suite for orchestra and solo violin or oboe. In the late 1730s, he revised it, choosing the fashionable traverse flute as solo instrument. According to C.P.E. Bach, the great French flautist Pierre-Gabriel Buffardin paid Bach a visit in Leipzig sometime after 1735. Buffardin had once taught Bach’s brother Johann Jakob and was, by the 1730s, employed at the court of the Elector of Saxony in Dresden. Perhaps Buffardin’s visit occasioned the revision of this suite and the addition of the Polonaise, one of the most beloved dances at the Saxon court. Francesco Bartolomeo Conti’s offertory Languet anima mea was a part of Bach’s library by 1716. It must have been a favourite, because he performed it later in Cöthen and in Leipzig. Conti was the principle theorbo player at the Hapsburg court in Vienna, whose skill was so acclaimed that he was called “the first theorbist of the world”. He also distinguished himself as an opera composer. His flair for drama and vocal fireworks is also clear in his sacred music like this setting of ecstatic love poetry to Christ. Like Conti, Bach married a virtuoso soprano. Might their wives have performed Languet anima mea with them? In Cöthen, Bach was not responsible for church music, so he probably programmed this piece as chamber music, and who better to sing it than the court’s second-highest paid musician, Anna Magdalena. Alessandro Marcello’s Oboe Concerto in D Minor, SD 935 may have been among the pieces that Johann Ernst of Saxe-Weimar acquired in the Netherlands. Bach transcribed it for harpsichord, exploring how to recreate orchestral crescendos on the harpsichord. Marcello was, like Bach, an avid collector of musical materials, creating a gallery of musical instruments which can still be seen in the Museo Nazonale degli strumenti Musicali in Rome. His diverse pursuits included painting, drawing, and writing poetry, besides his work as a diplomat, lawyer, and judge. Like Bach’s Orchestral Suite in B Minor, Telemann’s Quatuor No. 1 in D Major was inspired by great French musicians, including flautist Michel Blavet and gamba player Jean-Baptiste Forqueray. Telemann met them on a trip to Paris and wrote this music, the epitome of the immediately appealing and elegant style galant, for them. Forqueray liked these quartets so much that he continued to programme and perform them for years. Publishing the Nouveaux quatuors was one of Telemann’s most ambitious printing projects. The publication sold by subscription to 287 subscribers including a “Mr. Bach de Leipzig”. Perhaps Bach ordered this fashionable music for the coffee house performances of his student ensemble, the Leipzig Collegium Musicum. Handel’s Silete venti is the only piece on this programme that cannot be directly connected to Bach’s library, though Bach did own a copy of another of Handel’s cantatas for solo soprano, Armida Abbandonata, which he had copied for his Collegium Musicum. In fact, it is not impossible that Bach knew Silete venti, since none of the more than 500 programmes that he performed with the collegium survive, and we can only guess at what he and the students performed based on the fragments of his musical library that survive. Why Handel wrote this cantata, a meditation on the soul’s love for Jesus, is also unclear. It has no obvious liturgical function and is one of Handel’s most impressive solo works, certainly demanding a star singer. Like Conti’s Languet anima, it exploits all the drama of the theatre, beginning with rustling winds painted by the orchestra and suddenly interrupted by the soprano’s entrance, and an athletic alleluia finale. Bach’s music lines the shelves of private and public music libraries around the world today and continues to provide comfort and inspiration 268 years after his death. This programme gives an acoustic window into Bach’s world; these were some of his favourite things. Bach Collegium Japan performs frequently in Japan and overseas with the aim of presenting ideal interpretations of Baroque music centring on the religious works of J.S. Bach. In 1995 the ensemble embarked on a project aimed at recording Bach’s complete church cantatas in chronological order. This project was eventually completed in February 2013 and has met with lavish praise in Japan and overseas as an internationally outstanding and exceptional achievement of the first order. Bach Collegium Japan and Masaaki Suzuki were awarded the 45th Suntory Music Prize in 2014. This was also the year when they performed for the first time as far afield as New Zealand and Mexico. The activities of the ensemble are thus increasingly overstepping national borders to win the ensemble a high degree of international recognition. Since founding Bach Collegium Japan in 1990, Masaaki Suzuki has established himself as a leading authority on the works of Bach. He has remained their Music Director ever since, taking them regularly to major venues and festivals in Europe and the USA and building up an outstanding reputation for the expressive refinement and truth of his performances. In addition to working with renowned period ensembles, such as Collegium Vocale Gent and Philharmonia Baroque, he is invited to conduct repertoire as diverse as Britten, Beethoven, Fauré, Mahler, Mendelssohn, Mozart and Stravinsky, with orchestras such as the Baltimore Symphony, Danish National Radio Symphony, Deutsches Symphonie Orchester Berlin, Leipzig Gewandhausorchester, New York Philharmonic and the San Francisco Symphony Orchestra amongst others. This season sees Suzuki debut with the Orchestra of the Age of Enlightenment on a European tour. Suzuki’s impressive discography on the BIS label, featuring all Bach’s major choral works as well as complete works for harpsichord, has brought him many critical plaudits – the Times has written: “it would take an iron bar not to be moved by his crispness, sobriety and spiritual vigour”. 2014 marked the triumphant conclusion of Bach Collegium Japan’s epic recording of the complete Church Cantatas initiated in 1995 and comprising fifty-five volumes. This major achievement has been recognised with a 2014 ECHO Klassick ‘Editorial Achievement of the Year’ award. In 2010, Suzuki and his ensemble were awarded both a German Record Critics’ Award (Preis der Deutschen Schallplattenkritik) and a Diapason d’Or de l’Année for their recording of Bach motets, which was also honoured in 2011 with a BBC Music Magazine Award. The ensemble has now embarked upon extending their repertoire with recent releases of Mozart’s Requiem and Mass in C minor; Suzuki recently released a disc of works by Stravinsky with the Tapiola Sinfonietta. Recent highlights with Bach Collegium Japan include a visit to North America performing in cities such as Boston, Chicago, Los Angeles, New York and Washington, as well as a European tour including a weekend residency at the Barbican Centre, London, return visits to the Amsterdam Concertgebouw and Théâtre des Champs Elysées, Paris, and debut appearances at Dublin’s National Concert Hall, the Vienna Konzerthaus and the Mariinsky Theatre, St. Petersburg. 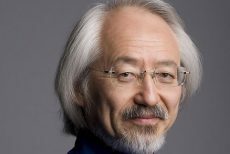 Masaaki Suzuki combines his conducting career with his work as organist and harpsichordist. Born in Kobe, he graduated from the Tokyo University of Fine Arts and Music with a degree in composition and organ performance and went on to study harpsichord and organ at the Sweelinck Conservatory in Amsterdam under Ton Koopman and Piet Kee. Founder and Professor Emeritus of the early music department at the Tokyo University of the Arts, he was on the choral conducting faculty at the Yale School of Music and Yale Institute of Sacred Music from 2009 until 2013, where he remains affiliated as the principal guest conductor of Yale Schola Cantorum. Regularly collaborating with Juilliard Historical Performance, this season sees them on a tour of New Zealand. In 2012 Suzuki was awarded with the Leipzig Bach Medal and in 2013 the Royal Academy of Music Bach Prize. In April 2001, he was decorated with ‘Das Verdienstkreuz am Bande des Verdienstordens der Bundesrepublik’ from Germany. Joanne’s operatic engagements have included her ENO debut in Steven Pimlott’s production of Monteverdi’s L’Incoronazione di Poppea conducted by Harry Christophers, the role of Helena in Britten’s A Midsummer Night’s Dream in Venice conducted by Sir John Eliot Gardiner and directed by David Pountney, a tour of Purcell’s Dido and Aeneas in Spain and semi staged productions of Monteverdi’s Orfeo in Paris and for the Beijing International Music Festival (directed by Sir Jonathan Miller). In concert, Joanne has performed in Bach’s St Matthew Passion with the Orchestra of the Age of Enlightenment conducted by Sir Roger Norrington, with the Rotterdam Philharmonic Orchestra and with the LSO at the Barbican Hall. She has appeared as soloist in Messiah in the Halle Handel Festival, at St. Mark’s Venice, and with Bach Collegium Japan (Suzuki) and with the Mozarteum Orchester in Salzburg, as well as in Handel’s L’Allegro and Haydn’s Heiligmesse, Harmoniemesse and Paukenmesse with the Monteverdi Choir and Sir John Eliot Gardiner. Her busy concert schedule has also featured Bach’s Magnificat at the BBC Proms with the Academy of Ancient Music, and with Bach Collegium Japan, Rutter’s Requiem with the Royal Liverpool Philharmonic Orchestra conducted by the composer, Haydn’s The Seasons with the Huddersfield Choral Society, Fauré’s Requiem in Toulouse directed by Marc Minkowski, Bach Mass in B Minor with Bach Collegium Japan conducted by Masaaki Suzuki, with the Academy of Ancient Music in Alzenau and with Les Musiciens du Louvre and Minkowski, for the Akademie der alte Musik, and at the Sage, Gateshead. She has appeared in Mozart’s Mass in C Minor for the City of London Sinfonia and Melbourne Symphony Orchestra, Mozart Requiem in Moscow and at the Mariinsky Concert Hall, St Petersburg, Purcell’s The Blessed Virgin’s Expostulation and The Fairy Queen in Salzburg, Easter Oratorio with the BBC National Orchestra and Chorus of Wales under Nicholas Kraemer, Nelson Mass for the Ulster Orchestra, Rutter Mass of the Children at St Paul’s Cathedral and at Symphony Hall, Birmingham, Harmoniemesse for Scottish Chamber Orchestra, L’Allegro, Il Penseroso ed il Moderato at the Handel Festival in Göttingen, The Creation at Cadogan Hall and Zelenka’s Missa Votiva for Musik Podium Stuttgart, Mozart Exsultate Jubilate, Mahler 4th Symphony at the Tchaikovsky Concert Hall, Moscow. Further concert performances have ranged from Saul with Cappella Amsterdam and with the Estonian Philharmonic Chamber Choir, to the first performances of J.C Bach’s Mailänder Vesperpsalmen with Concerto Köln at the Frauenkirche, Dresden, Bach Cantatas with Le Concert Lorrain, Belinda Dido & Aeneas in Warsaw, Israel in Egypt with Düsseldorfer Symphoniker, St John Passion with Les Musiciens du Louvre (Minkowski) and Graun’s Der Tod Jesu with Collegium Vocale. She also appeared at the Niedersächsische Musiktage with Bach Collegium Japan in programmes of Bach Cantatas, and also in Christmas Oratorio at the Tonhalle, Zürich (Suzuki), concerts with Bachakademie Stuttgart and Tafelmusik (Toronto), a tour of L’Allegro, Il Penseroso ed il Moderato with Rudolf Lutz, Bach Cantatas with Ensemble Pygmalion (Raphaël Pichon), a US tour with Bach Collegium Japan, Messiah with Tafelmusik (Toronto), Israel in Egypt and St John Passion with Concerto Copenhagen. Recent engagements include Dafne Apollo e Dafne with Concerto Copenhagen at the Copenhagen Opera Festival, Monteverdi Vespers with the Dunedin Consort, Bach Secular Cantatas and Mass in B Minor with Bach Collegium Japan, Messiah with the Hallé Orchestra and also with Bournemouth Symphony and Christmas Oratorio with Le Concert Lorrain. Engagements in 2017/2018 include Chandos Anthems with the Dunedin Consort, The Creation with Leeds Festival Chorus, a European tour of Brockes Passion with Ensemble Pygmalion, Mozart Mass in C Minor with Tafelmusik in Toronto, Bach Cantatas at the Wiener Konzerthaus, appearances in concert with Bachfest Leipzig, recitals in Florence, Schloss Elmau and at the Musikfest Eichstätt, Creation with Warsaw Philharmonic, Messiah with Tafelmusik in Toronto, Bach Cantatas with Le Concert Lorrain and St John Passion with Holland Baroque Society.